There's something dramatic and yet simple about doing a painting in a single ink color. It has a certain kind of power. If you were to visit the Clearcreek State Park you would be greeted with a great deal of trees throughout the park and along the river's edge. 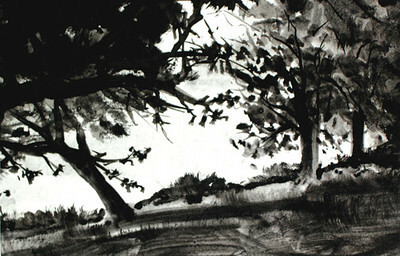 When I painted this on site, the sun was extremely strong and the trees were almost completely silhouetted. The river's reflection was brilliantly bright . I was captivated by the leaning tree. It stood out, appearing to want to pull away from other perfectly vertical trees nearby.